Join us on a Spiritual Pilgrimage through prayer with Father Dennis Aréchiga, pastor of St. Matthew Catholic Church in San Antonio; along with fifty-five pilgrims from the San Antonio area, Austin, and Montana. The family and friends of all those traveling on this pilgrimage will be offered in prayer during daily Mass on this Journey with Mary. Please pray for the pilgrims, as well as your own intentions and those of the Church. October 31 –November 1: Depart San Antonio to LISBON, Portugal. Excitement, anticipation, joy and wonder accompany the pilgrims in their thoughts and conversation as they travel across the Atlantic Ocean on this wonderous journey with Mary, the Mother of God. Upon arrival in Lisbon Airport, we will take a private motor-coach to Fatima, an approximate one and a half hour drive. 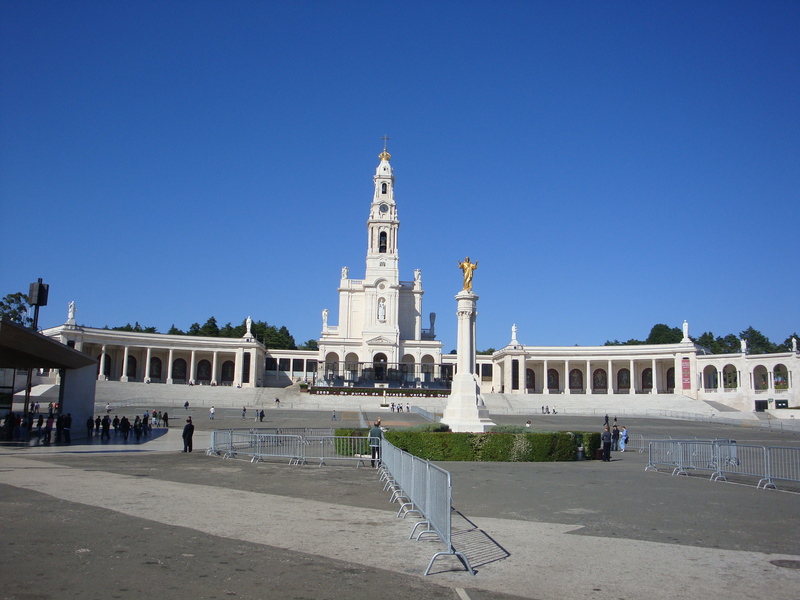 We will have our first Mass in the Basilica of Fatima where the tombs of the three seers of Our Lady’s apparition are located. They are Blessed Francisco, Blessed Jacinta and Sister Lucia. Prayer: Lord Jesus, you call us each by name. Thank you! We ask your blessing upon each pilgrim. May they have a safe journey and may their journey of faith bring them closer to your Sacred Heart and to encounter the maternal love of your Mother, Mary. Lord Jesus, hold us in your arms and protect us always. Glory be to the Father, to the Son and to the Holy Spirit as it was in the beginning is now and forever. Amen. 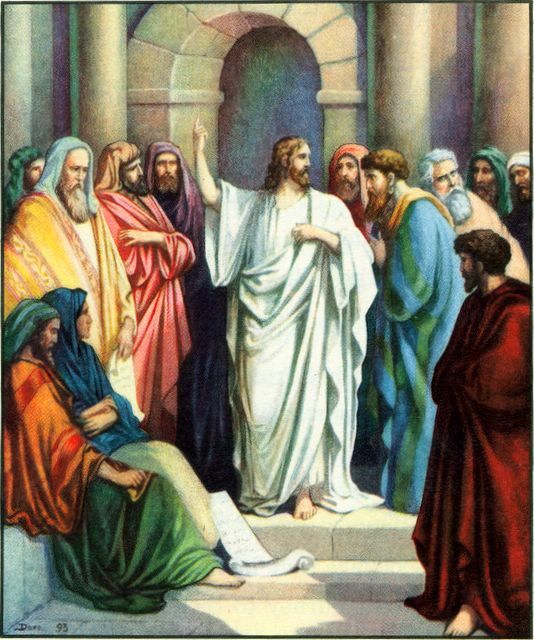 The scribes and Pharisees were charged with the responsibility of leading the Chosen people in a faithful relationship with God and so they had a religious authority to teach and uphold the Law of Moses. Their titles and authority were meant to be at the service of God for the good of the people. However, for these leaders, their titles had become and end in themselves instead of a means to the greater end of eternal life. They were using their titles for their own glory and for their own purpose. It is for this reason Jesus tells the crowds not to seek after titles for the sake of the title, no mater what the title might be. Every title is given for the greater purpose of looking beyond the title to the service of the Kingdom of God. He singles out the titles Rabbi, Father and Master ( in another translation, teacher), but he could use any title. All authority, all gifts and talents come from God and are meant to be of service to the Kingdom of God. Jesus is not telling us we should not use titles. He is telling us we must know where the authority for those titles comes from and then be good stewards of that authority. Almost all of Jesus’ teaching can be referenced back to the Greatest Commandment, “We must love the Lord our God with all our mind, heart, soul and strength.” There can be nothing in our lives more important than God and His plan of salvation. If we find any teaching in the Scriptures to be difficult we can come back to this Commandment. Do we love God above everything or everyone, and do we put our total trust in Him? Have we ordered our lives to God by being faithful to all He has revealed to us through the Scriptures and the Church and committed ourselves to daily prayer and the sacramental life? This is how we discover the plan that He has for us and realize our own dignity and purpose in life. True humility is to know who we are in relationship with God and then be good stewards of what He has given us so we can reach our potential for happiness. Jesus was not only chastising the Pharisees of two thousand years ago. He is chastising every person in every age who has not made the Kingdom of God his priority. God chastises those whom He loves and He loves all of us. We all must be purified of wrong intentions that are self serving. Every good gift comes from God, but if God is not recognized as its source and it is not used for His greater good it will not reach its potential for greatness and may even be an obstacle to His plan. There have been many great people who have accomplished great things, but what is the value of their accomplishments in the plan of God. Let’s pray that in his final moments Steve Jobs was able to humbly surrender his life to God and after purification discover the unimaginable greatness of heaven where even the poorest most uneducated person shares in the wisdom of God. If you want to talk about a powerful Catholic woman (besides our Blessed Mother), St. Teresa of Avila is it. Teresa lived in sixteenth-century Avila, Spain. She was beautiful, intelligent, and headstrong. As a teenager, she ran away from home and entered a Carmelite convent (her father, who had originally opposed her entering, later gave his approval). After she took vows, she became seriously ill, and her health was permanently impaired. She also began receiving heavenly visions. Word spread throughout Avila, and people became concerned that she was influenced by evil spirits. She was cross-examined by many priests and religious including Dominicans and Jesuits, who deemed her visions to be holy and true. In the portrait above my desk, she holds one hand over her heart; a special memorial day in the Church celebrates the day her heart was ‘pierced’ with deep love for God. The experience for her was like an angel piercing her through with a flaming arrow. 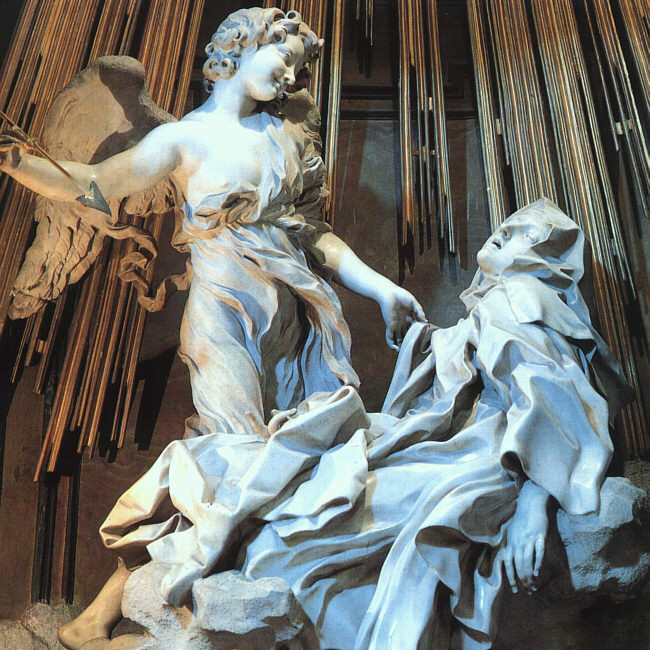 Bernini’s famous sculpture The Ecstasy of St. Teresa illustrates this event. Her incorrupt heart can be seen and venerated today. Even with her poor health, she believed that the convent she had entered needed reform. She established the convent of Discalced Carmelite Nuns of the Primitive Rule of St. Joseph. After the Carmelites’ head honcho expressed his admiration and approval, she began reforming the Carmelite order, with the help of St. John of the Cross. This was not an easy task; she faced violent opposition but always marched forward with her eyes on Jesus. 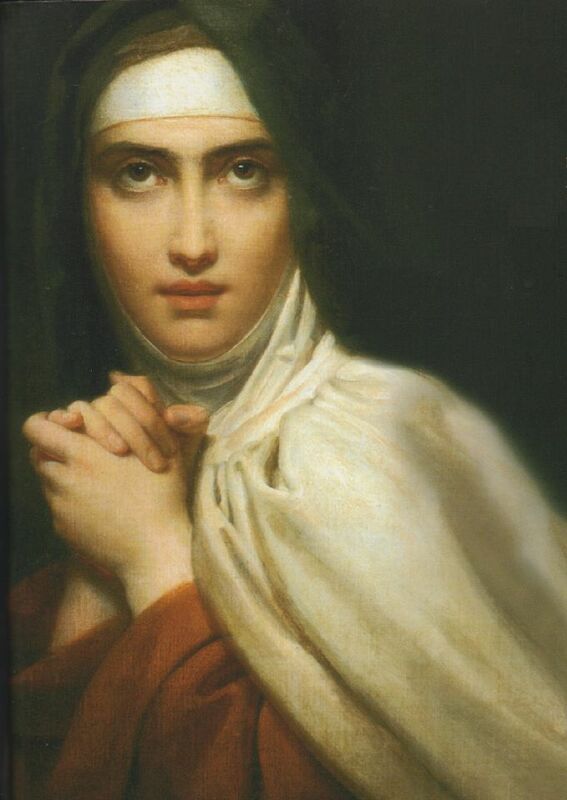 Teresa died Oct. 15, 1582. Paul VI declared her the first female Doctor of the Church. Teresa, pray for us.